Japan’s northernmost island of Hokkaido is different to the rest of Japan in many ways. The first thing that one notices is the amount of space available. The capital city of Sapporo is a place of wide streets and houses of a decent size, rather than the cramped apartments of other major cities in Japan. Hokkaido is still home to the indigenous people of Japan, the Ainu (as opposed to the Yamato people who came later). However, this northern Island was not truly part of Japan until 1869 when the short-lived Republic of Ezo was established by ex-Tokugawa samurai and then annexed by the Japanese Imperial Army. Previously there had been minimal interaction between the this island and the Japanese. The Ainu, who had been gradually been pushed out of the other islands, were able to live in Hokkaido in their traditional ways, as they had done for thousands of years. However, in the middle of the 19th century Japan was in crisis. In 1852 (and again in 1854) Commodore Matthew Calbraith Perry had forced the previously isolationist Japanese to open up to the modern world. The Japanese had quickly realized that if they wanted to avoid being colonized by the Western nations then they would have to learn to beat them at their own game. However, the Shogun (Japan’s military dictator whose family had ruled for the past 250 years) was proving ineffective at dealing the the Westerners. This encouraged a number of samurai lords in the western half of Japan, who had always harboured a grudge against the ruling Tokugawa family, to rebel under the pretext of restoring the Emperor (who had been little more than a religious figurehead) to the seat of power. 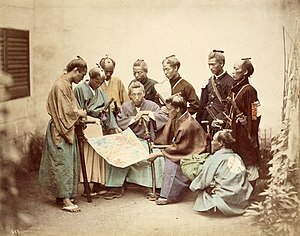 The Boshin War (The War of the Year of the Yang Earth Dragon) became a bitter fight for the future of Japan with the Imperialists being supported by the British and Americans and the Shogunate forces being supported by the French. Both sides were sold modern weaponry and the war stood as testament to how much Japan had progressed in just fourteen years since reopening. However, this was was not a fully modern war and much of the fighting was done in the old style. The war barely lasted a year and ended in complete defeat for the Tokugawa Shogunate forces in 1868. However, the Tokugawa retainers refused to give up. The Shogunate Admiral Enomoto Takeaki took the remnants of the Tokugawa forces to the island of Ezo (now called Hokkaido). This island had been at the fringes of Japanese influence, it was sparsely populated by settlers and the indigenous Ainu population. Enomoto, with a handful of French advisors and around 3000 soldiers, fled to the island. Once there he wrote to the newly established government of Emperor Meiji asking permission to develop Ezo and continue the traditional Japanese way of life unmolested by modernisation. His request was denied. To the Meiji government Enomoto represented a link with the past which had to be severed if Japan was to become a truly modern nation able to stand up to the West. 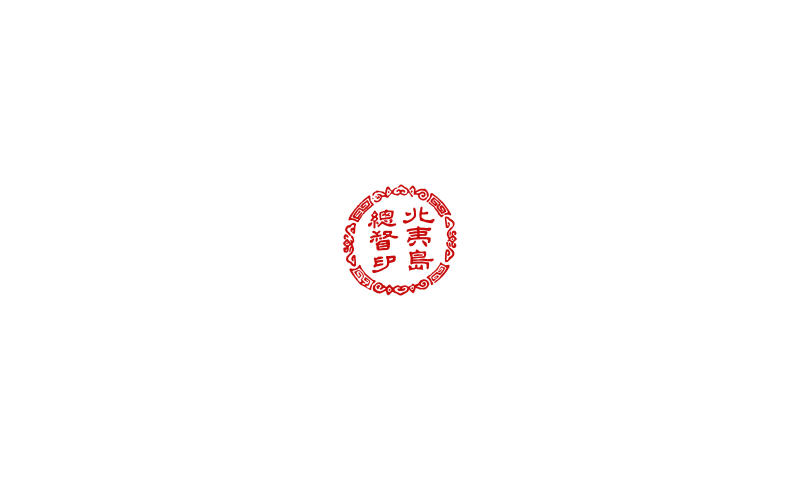 Enomoto was forced, therefore, to create the independent Republic of Ezo on January 27 1869. The Republic was to be based on the model of the United States of America. In the first election ever held in Japan Enomoto was elected as first President and the new Republic gained partial recognition from Britain and France (it was conditional on recognition from Japan which was not given). 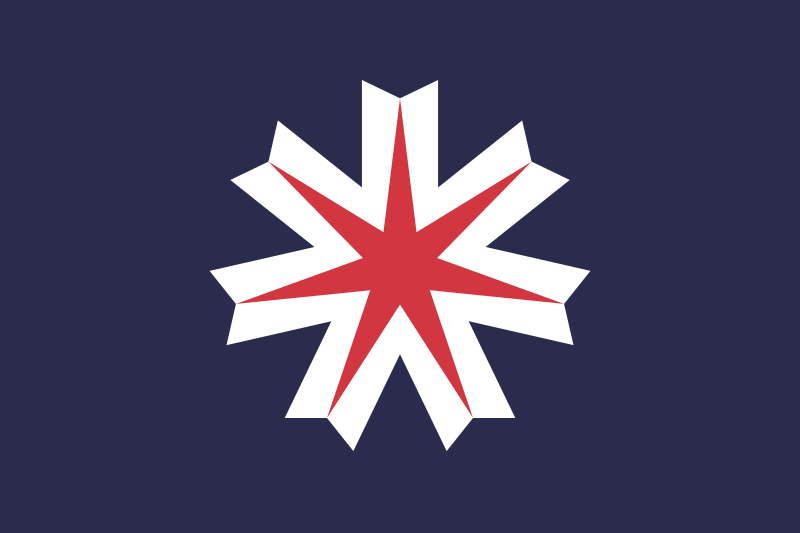 The flag of the republic (as seen above) was a chrysanthemum blossom as the symbol of imperial rule, a red star as the symbol of the new republic on a field of blue. This tiny nation was also surprisingly wealthy. Shortly before fleeing Japan Enomoto had looted the treasury of Osaka castle and taken this with him to Ezo. This was the sum of 180,000 gold Ryo (in todays money 1 Ryo is roughly 180,000 yen). This vast wealth allowed Enomoto to begin fortifying Ezo by building a star-fort Goryokaku on the peninsula of Hakodate (the closest point to mainland Japan). He also modernised the army and set up a hybrid Ezo-French command. The French leader of the army was Jules Brunet, a military advisor to the shogunate during the Boshin war (and the inspiration for Tom Cruise’s character Nathaniel Algrin in The Last Samurai). 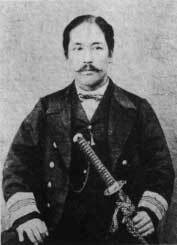 He had been sent to Japan by Napoleon III but had been ordered back to France following the defeat of the shogunate. Brunet refused to leave and resigned his commission in the French Army and took up the post of Second in Command of the forces of Ezo. However, it wasn’t long before an invasion from the Japanese was launched. 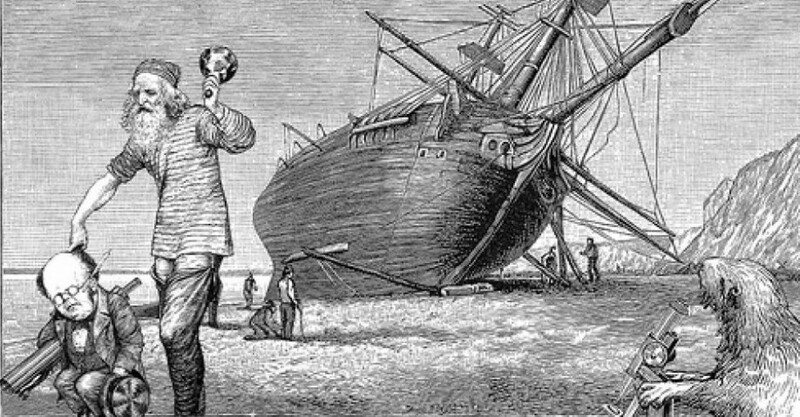 March 1869 Japan engaged in its first modern naval battle in Miyako bay swiftly defeating the much smaller navy of Ezo, using a combination of Gatling guns and ironclad ships purchased from the US. This led to a ground invasion in April when the Japanese landed 7,000 men in Ezo, landing at Hakodate the Imperial forces soon surrounded the fortress of Goryokaku. Unable to take the fortress the Imperial forces spread out to take most of the peninsula. In an attempt to break the siege of Goryokaku Ezo sent its entire (and modern) navy comprised of French steam ships. Despite the Ezo navy now outnumbering the Imperial navy they were still defeated thanks to the prowess of Admiral Heihachiro Togo (who would become famed as “the Nelson of the East”). Brunet surrendered after this defeat and was sent back to France where he would go on to eventually become chief of staff to the Minister of War. With no hope of relief Enomoto surrendered to the Imperial force and was taken back to Tokyo where he was imprisoned for two years. Ezo was renamed Hokkaido (meaning North Sea District). Enomoto would serve his prison sentence and serve on a number of important government posts in Tokyo including Foreign Minister and Naval Minister before being ennobled as a viscount and eventually appointed to the Privy Council. It is easy to see the Republic of Ezo as a secessionist state. However, this would be to ignore the fact that Enomoto went out of his way to profess his loyalty to the Emperor and that it was his goal to simply create a new province of Japan which would remain an enclave of the old ways. Therefore the establishment of the Republic of Ezo could be seen as Japan’s very first territorial expansion. Other than a few disparate settlers the Japanese had no official presence in Hokkaido prior to Enomoto’s escape there. Enomoto certainly did not see himself as a separatist. Whatever the point of view he set up the first democratic system in Japan and was the object of Japan’s first modern war. The Japanese portrayed this conflict as a romantic end of the samurai at the hands of the modern Imperial army. This ignores the reality that it was Japan’s first modern conflict. This is a much ignored area of Japanese history despite its importance in the story of Japanese modernisation as the first modern conflict, first democracy and first territorial expansion in Japanese history. In addition all of the characters on both sides would go on to shape history. Enomoto and Admiral Togo would play a prominent role in the expansion of the Japanese Empire into Korea and Taiwan, and Brunet would be an important character in the Franco-Prussian war that ended the reign of Napoleon III and created the German nation. You write about the most interesting things! I didn’t know much of the above (although I feel a reluctant to admit that), but thanks to you – now I know! Thanks I am glad you are enjoying them!